TruePublica Editor: Fake news is now endemic in our society and mainstream media are just as culpable as any organisation. Take for instance the medical industry where articles of very dubious content regarding our health are in the press daily. One authority who is clearly exasperated on the matter is Dr. Richard Horton, the current editor-in-chief of the Lancet – considered to be one of the most well respected peer-reviewed medical journals in the world. Dr. Horton recently confirmed in a statement declaring that a lot of published research is in fact unreliable at best, if not completely false. From the International Consortium of Investigative Journalists comes another story to back up our assertion that fake news is so prevalent that knowing truth from lies is becoming more difficult by the day, much of it being generated by those we have traditionally trusted the most. By Scilla Alecci – ICIJ: Hundreds of thousands of scientists worldwide have published studies in self-described scientific journals that don’t provide traditional checks for accuracy and quality, according to a new journalistic investigation. Dozens of reporters from media outlets in Europe, Asia and the United States have analysed 175,000 scientific articles published by five of the world’s largest pseudo-scientific platforms including India-based Omics Publishing Group and the Turkey-based World Academy of Science, Engineering and Technology, or Waset. In addition to failing to perform peer or editorial committee reviews of articles, the companies charge to publish articles, accept papers by employees of pharmaceutical and other companies as well as by climate-change sceptics promoting questionable theories. 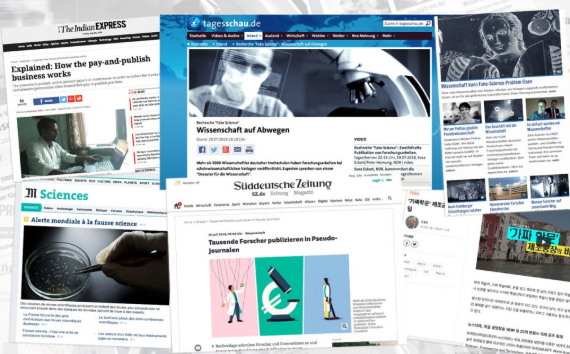 Some of those publishers send targeted emails to scientists who are under pressure to publish as many articles as possible in order to obtain promotions and improve their curriculum, according to the findings by Norddeutscher Rundfunk (NDR), WDR and Süddeutsche Zeitung. In addition to the German outlets, a group of more than a dozen media organizations including the New Yorker, Le Monde, the Indian Express and the Korean outlet Newstapa took part in the investigation. The International Consortium of Investigative Journalists facilitated the collaboration. Although the existence of these internet-based pseudo-scientific journals is not new and has been warned against by universities and research institutions, its recent rapid growth — with the number of publications put out by the top publishers tripling since 2013 and involving some 400,000 scientists – set off alarms among former Nobel Prize winners. The credibility of science is at stake, said U.S. physician Ferid Murad, the 1998 winner of the prize in physiology or medicine. Randy Schekman, a U.S. cell biologist who was among the 2013 winners of the Nobel prize, said that he was horrified that scientists were publishing in such journals. “This kind of thing has to be stopped,” said Robert Huber of Munich, who was awarded the prize in 1988. “If there is a system behind it, and there are people who aren’t just duped by it but who take advantage of it, then it has to be shut down,” said Stefan Hell, a Nobel laureate in chemistry. Those journals contribute to the production and dissemination of “fake science” by failing to uphold basic standards of quality control, the report said. In Germany alone, more than 5,000 scientists — including those supported by public funding — have published their articles in such predatory journals, which have been increasing for the past five years. While those journals’ publishers claimed that a panel of scientists is in charge of verifying the accuracy of the papers, the investigation showed that articles are published within a few days of submission without any vetting process. In one case, an article in the Journal of Integrative Oncology stated that a clinical study had shown the extract of propolis, a secretion that bees use to glue hives together, was more effective than chemotherapy in treating colorectal cancer. The study was fake and the authors were affiliated with a research centre that doesn’t exist, Le Monde reported. After the journalists questioned the journal about those findings, the article was deleted but an archived version is still available online. Omics, which published the journal in question, claims to have published over 1 million articles and is currently being investigated by the U.S. Federal Trade Commission for alleged fraudulent claims, according to the Indian Express. A spokesman has denied any wrongdoing and defended the integrity of its publications. Reporters from the media outlets involved in the investigation successfully published numerous non-scientific papers with the publishers whose practices they were examining and also participated in several of their conferences.